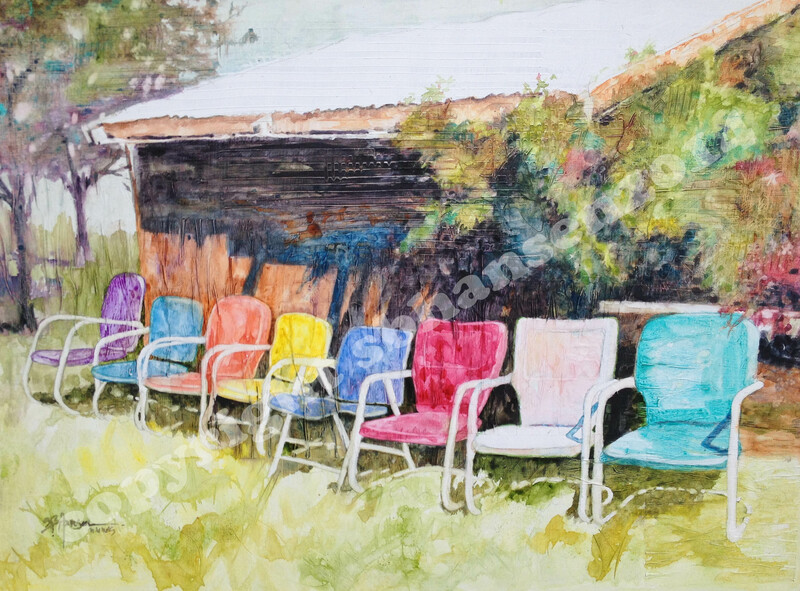 Gatherings…I can picture folks in these colorful lawn chairs. Visiting, having a glass of wine, and looking out to their kids playing in the yard in Hood River. I’ve had this photo in my mind for 2 weeks or so, thinking about what I want to say with it. There is nostalgia, there is friendship, there is leisure. Of course, I’m drawn to repetition and color! Here we go! I usually divide my paintings into thirds and pick one of the areas the lines intersect as the focal point. Here, you can see my circle in the lower LH third where I selected the blue chair for the focal point. After some thought, I change it to the front (RH) lower third because of the ease of all the shapes converging in this area. This is where I plan to have all my darkest darks and lightest lights. To allow me to paint all the chairs, the background, and the foreground, without worrying about saving the whites, I painted liquid mask (or frisket) to all the arm chairs. To enhance the idea of repetition of pattern and line, the arms provide an integral part of the design. I’ll return later into the whites to add detail. The focal point is near my brush(above photo). To draw the eye, I’ll keep the chair white, placing complementary colors red and green/blue next to the white chair. 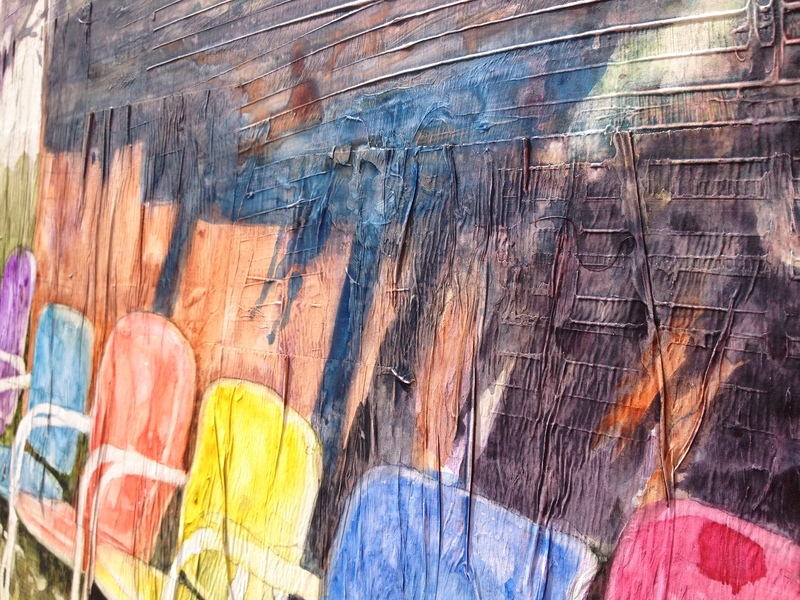 The darkest darks of the painting will be behind the chair, to make it POP. This is also where I’ll add the most detail to the painting. 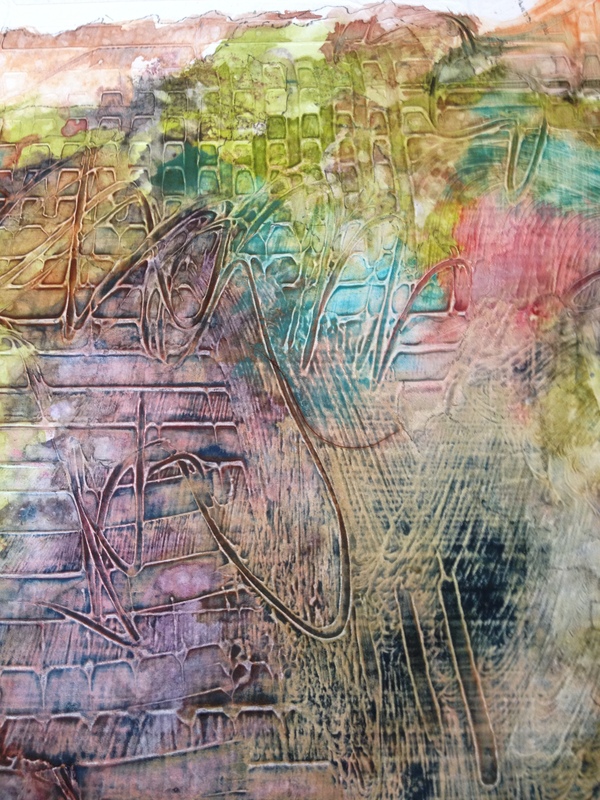 You can see the texture of the gesso impressions after painting. Pretty cool, huh? 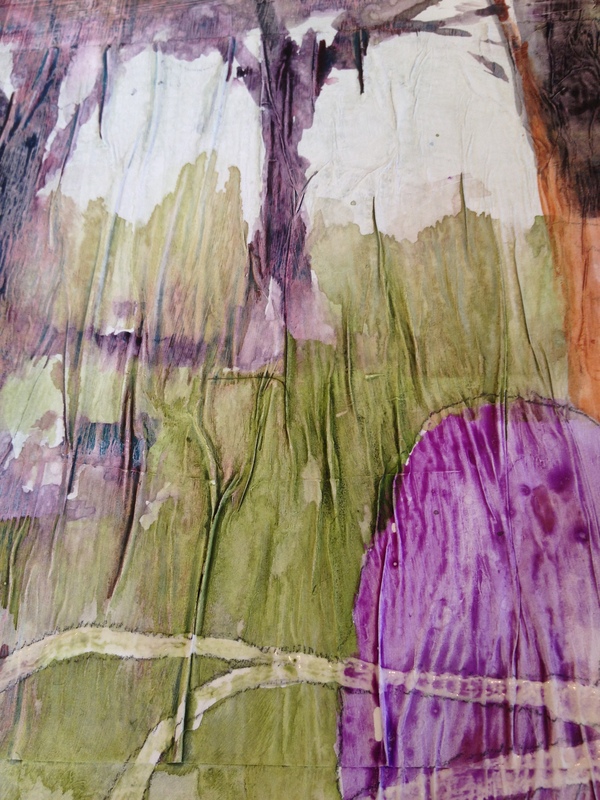 Here is a detail of the texture of the underlying tracing paper adhered to the plexiglass in this photo. Ooooo…I love this stuff! 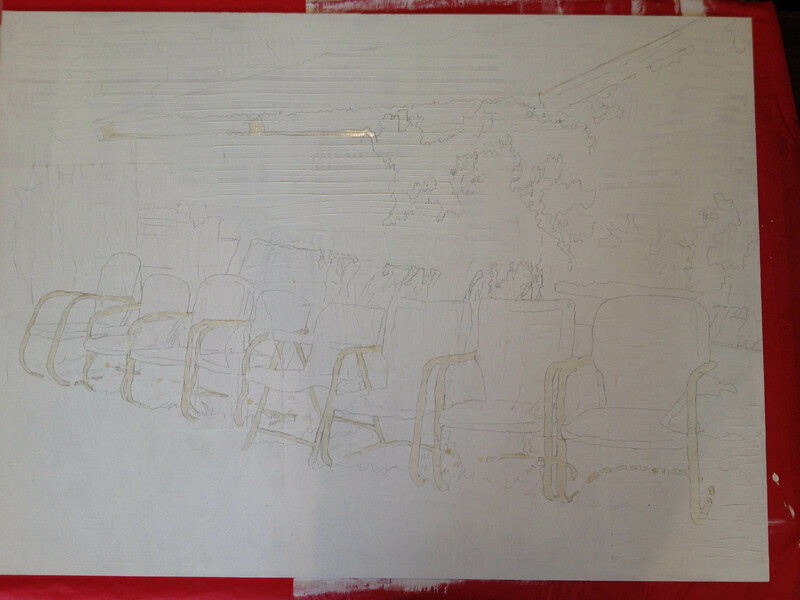 You can see how easy it is to paint the chairs and background without worrying saving the whites of the chair arms. (Okay, okay…this is hilarious. I decided, per suggestion of a very nice fellow blogger, to upload some videos to my blog, using YouTube. I’ve never done this before. It was pretty easy, but I thought I had removed the background music. Didn’t. And it is loud, so you can’t hear what I’m saying!) Also, I was soon made aware that the video needs to be in landscape mode, not portrait. Good grief. What a goof I am. Removing frisket video here. I promise to improve…REALLY! I spent about an hour or so going over each and every removed-frisket area to soften and enhance the arm chair lines. It took a while, but was worth the work. 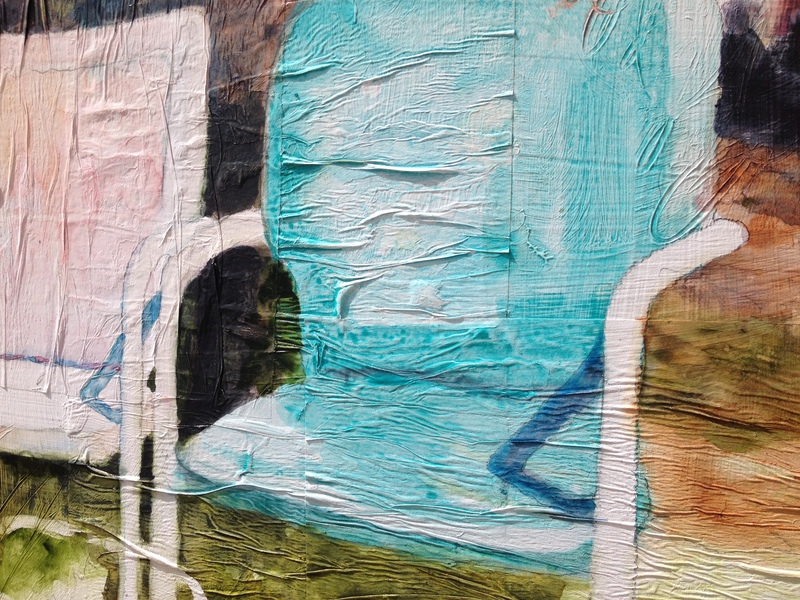 The chairs look finished and have shadows and detail. You might be able to see how much softer the lines are in the chairs. I had to rework the wisteria area. Difficult to explain what you want the viewer to see without explaining it all. I’m still not certain I’ll stay out of the wisteria bush. Feels weird to me, but I’m not sure what is wrong with it. So, video snafu aside, I’m overall pretty pleased with the outcome of the painting. I usually paint close-up, zoom-in-on-detail-type-paintings, but this was a fun departure. I love the chairs. I’m off to Portland next week, to check out the Saturday Markets and other fun stuff they have. Looking forward to some new material to paint to inspire you all!! There’s no rush. 🙂 I really like your art, so I felt you deserved it.